Drought has resulted in dramatic changes to production systems on many Australian dairy farms. For Pat and Michelle Quinn, who milk 500 Friesian/Jersey cows at Cohuna in the Murray River basin, a 40% drop in water supply forced a complete step change in their cropping and feeding regime. Prior to the drought years the Quinns followed a perennial, all year round grazing system reliant on irrigation. 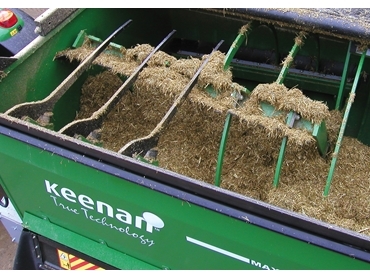 Three years ago they switched to an annual grass regime and TMR using a Keenan feeder wagon which they use in combination with the advice of Keenan nutritionist, Graeme Norris. The Quinns have since added Keenan ’s PACE system (Performance Acceleration and Control Enhancement) to their Mech-fiber 400 wagon. PACE is a unique wagon loading and mixing control system. The switch they have made from perennial to annual grasses has also boosted performance. Pat blends his own seed mix and his variety choices depend on the variables of milk price, rainfall and budget, ranging in price from $5/kg up to $25/kg.